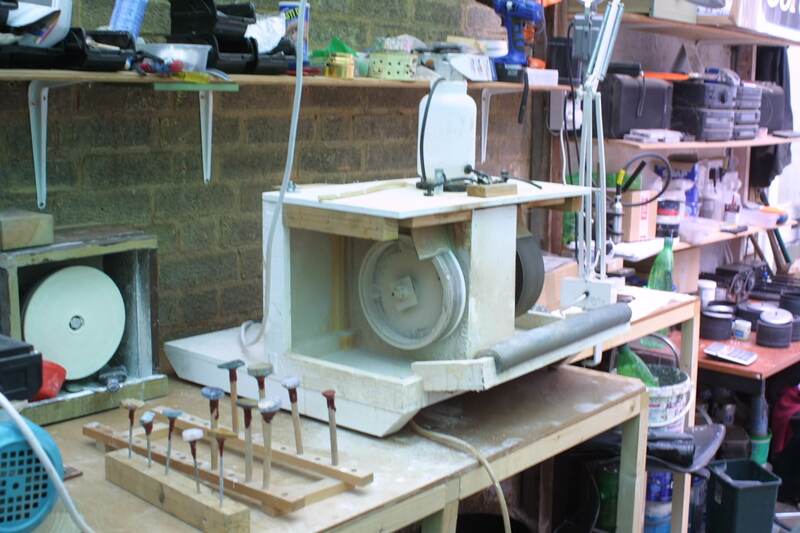 Welcome to our article abut how we built our homemade cabochon machine, in all it cost about £250.00 including wheels, motor and shaft and everything else that went into it. Here is a picture of the complete machine as you can see it’s relatively compact, none too pretty but it does the job. The whole thing is made of marine ply, we used a 4’ x 2’ x ½” sheet. First we cut a 2’ x 2’ piece to make the base, then used the rest to make the back and top. We used two wooden blocks to raise the shaft sufficiently to allow for clearance when the wheels were fitted to the shaft. The frame is made from bits of wood we had lying around in the workshop mainly 2” x 1/2”. Next we cut a hole in the back sheet to allow for the drive belt to pass through to the motor , once this was done we made a frame across the base to secure the back sheet to. Next we mounted the shaft in place on the base sheet, all marking out and measuring was done using the mark1 eyeball, nothing technical here! Now to the boring bit, we gave it many coats of exterior paint and after they had fully dried we applied a coat of plastidip wherever we could, just to make everything waterproof and completely seal all joints. We have two wheels mounted on the shaft, one is an 8” x 2” 100 grit diamond wheel, this thing is ferocious, and really shapes rock quickly, also does a good job on finger ends as well if you are not careful! We opted for the 8” diameter wheels simply because we wanted the maximum grinding area width that we could get, this set up would work equally well with 6” wheels as well. 2. should have made the lower splash tray at the front a few inches bigger so that it catches all of the spray from the wheels. Note: these motors are really good, when we are cutting and polishing they run for a good 8 hours a day with no complaints. thanks for getting in touch but sadly I don’t build machines for other people, there are too many regulations to comply with to make it viable. thanks for your message, the anwser is I didn’t need to adapt the spindle ends at all, the left end of the spindle is threaded so was no problem, I just got some large washers to support either side of the wheel. 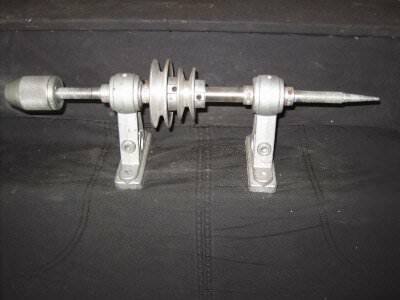 The right side has a pig tail on it, but then it becomes a normal spidle further in towards the pulleys, again threaded. Have a look at the new pics in the post, they will expalin it better than I can in words. I have to agree with them, a stepped three pulley will be an advantage as you will be able to slow things down, especially if you put a polishing belt on your expanding drum, you will be wanting to run a lot slower. There are several different types of electrical motors for sale on online sites and you can easily place the order online and get them delivered through the fast delivery and shipping process. 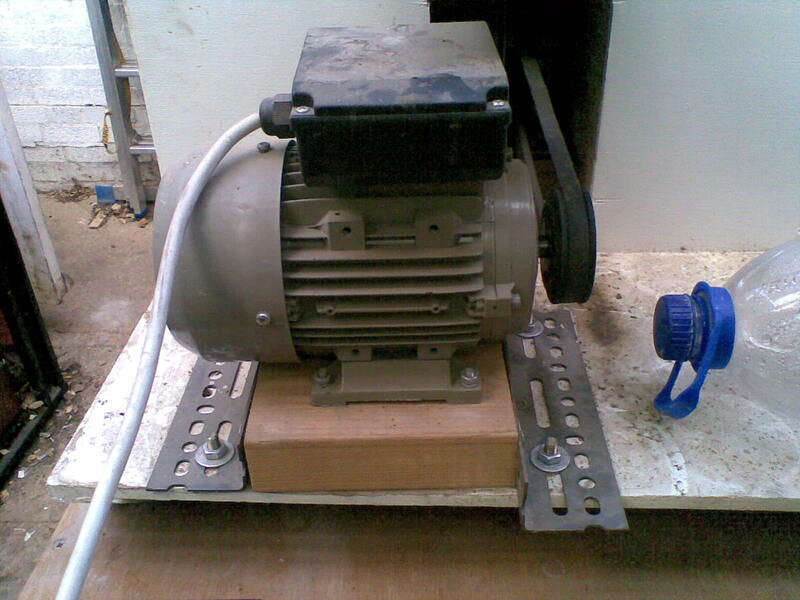 The electric motors for sale are available in single phase, three phase electrical motors and as well I HP electrical motors. You got to make the right decision for whichever purpose you tool for. Which electric motor is your favorite? We can help you find many for sale. Thanks for the pictures. It does help to see the set up as you have it. 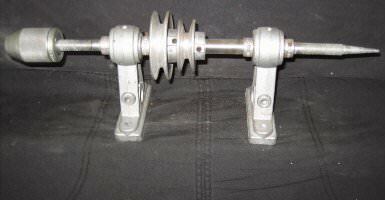 I will be ready soon to order my motor and pulley. I got an email from Manchester Minerals It said that a 1/1 ratio was okay with the 1400 motor. They also mentioned that if I were to have a 3 pulley system then I could half & double the speed of the wheel. Will I need this or is it best to stay with 1/1 ratio? Browsing through your text I have found answers for many questions that have been troubling me for long time now. Its problematic to find professional articles on the web as many those publications are made by a person with only partial knowledge of the topic. Your article is excellent and definitively worth recommending. I’ll return to read more of your texts in few days. 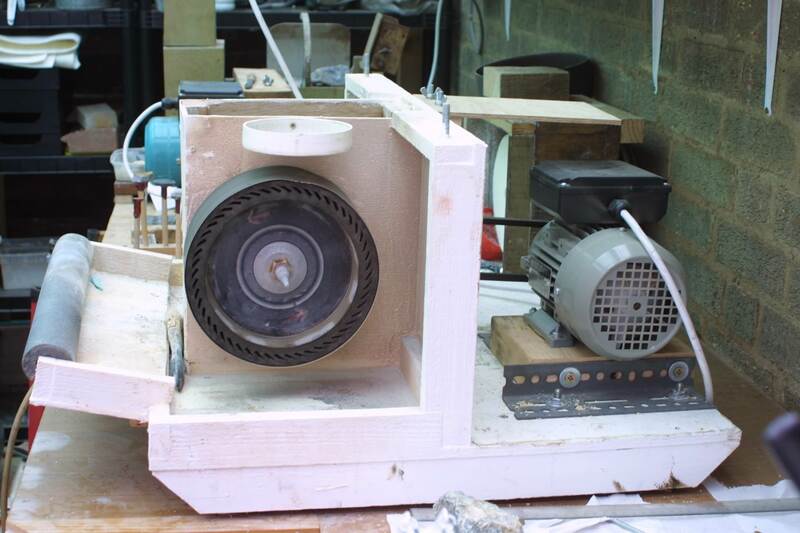 I want to have one solid Silicon Carbide wheel and one Expanding drum. Like yourself I think this will give me a bit more flexability. I think the arbor size is 1/2″ I will check this out. Thanks for the forth comming pictures. 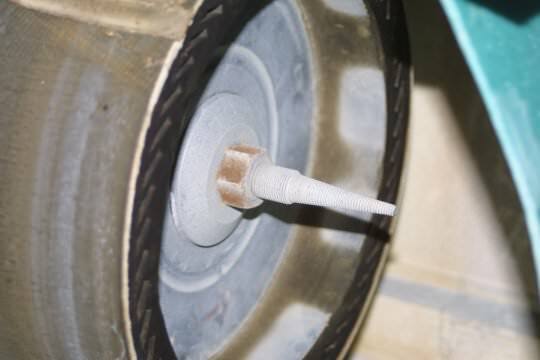 are you going to use silicon carbide grinding wheels or the expanding rubber drums with silcon carbide belts, this might make a difference to the RPM’s – not sure. I prefer the expanding drums simply because they are more versatile because you ca simply slip different grade belts on when required as you go through the process. 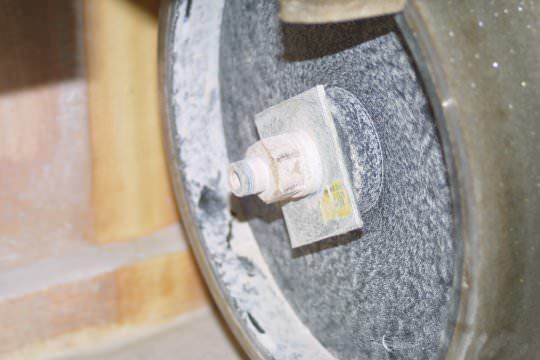 On my machine I have a 100 grit 8 ” x 2″ rigid diamond wheel for the rough shaping which is a permanent fixture, on the other side I have one 8″ x 3″ expanding rubber drum which I use for the silicone carbid belts. Regarding motor mounting, yes the motor does need to sit directly behind the pulley so that the belt comes off the pulleys at right angles otherwise the belt might slip off. 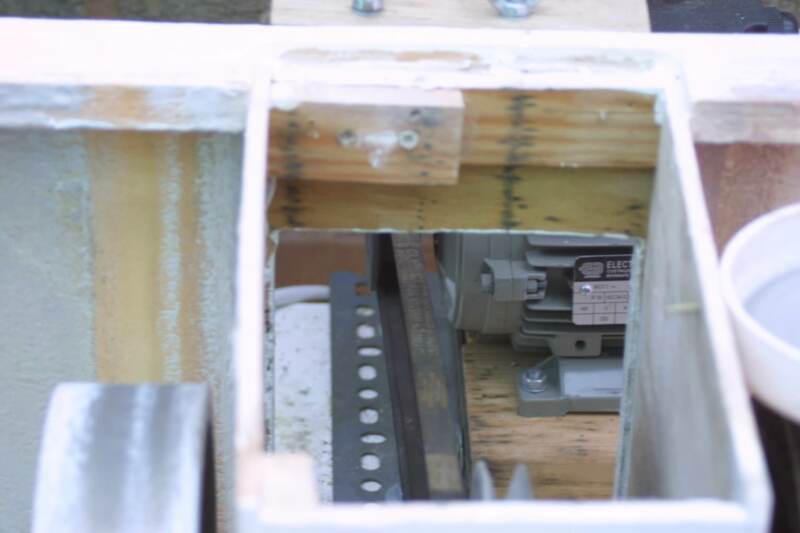 I mounted the motor on a block of wood which has a peice of right angled dexion plate on each side, because this has rectangular slots in it I am allowed some room to pull the motor back a little before tightening the bolts down, this allows me to get some tension on the belt. Will take some photo’s this week to show you what I mean. Did I ask you what dimater the pulley was on your arbor? Thanks for your help. I am looking at buying my grinding wheels at Manchester Minerals. They sell the ones you bought for your grinder 6″. I can email them to find out what the max rpm they run at. Does the grinder run at the same speed or will it need to speed up. Tony asked me if it ran on a 1:1 ratio. He also wants to know how far apart the motor will be from the pulley. I guess the motor will need to sit directly opposit the pulley on the arbor, but fixed on a solid surface. He also needs to know the width of the top (widest) of the pulley grove. Found the pic through photbucket thanks. Well that did not work!!! Can’t see how to send you the picture if you can email me then I will attach it. yes please do send me a picture over, also do the wheels have any indication of their maximum RPM on them as this will help also. 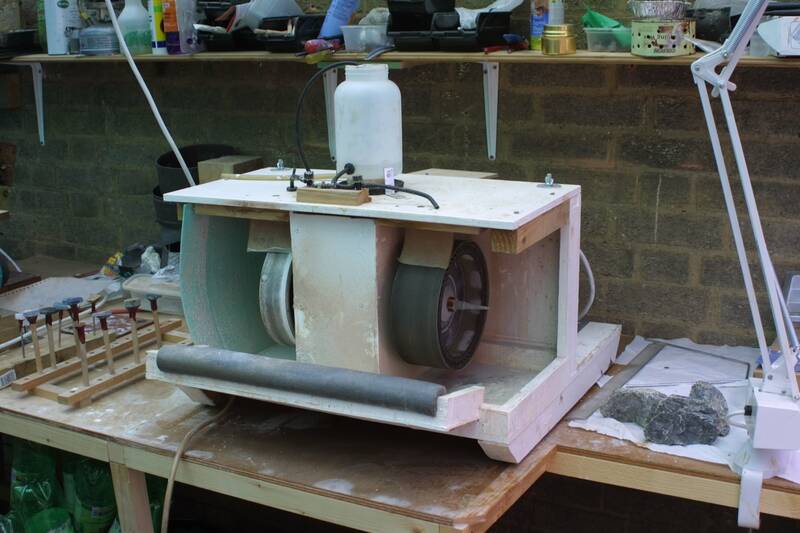 I have just bought a Lapidary Arbor which can take 2 x 6″ wheels. 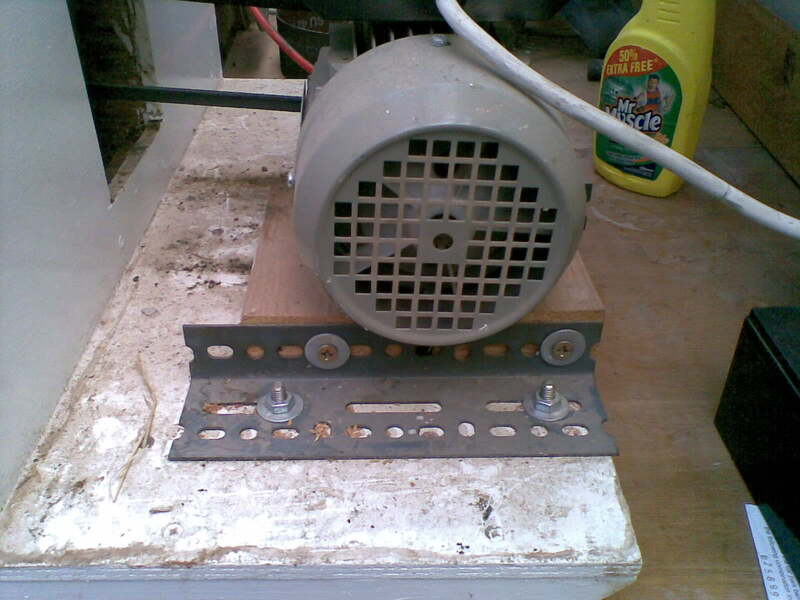 I have contacted the electric motor chap about a motor for my arbor. He has asked me lots of questions, and suggested I talk with you to try and help me with my requirements. I wonder if the smae motor as you suggested would be okay. The arbor is 1/2″. Will I need a belt and so on. If I could send you a picture of the arbor it might give you a better idea. Sorry for all the questions at once. Dermot. Hi Rebecca, you can purchase one of these machines from various places, if you are in the US you stand a better chance than you do in the UK but be warned they are very expensive, this was why I built my own machine. Another popular machine is the Diamond Pacific Genie, just google it there are plenty of suppliers in the US for this range, finally have a look at Ebay as machines occassionally come up for sale. Where can I purchase one of these cab machines and how much do they cost? Yes I got the pulley and motor fromTony at Goldcrest Technologies, I think the pulley was 70mm but I will measure it tomorrow and let you know. have just measured the pulley and it is 70mm absolute outside diameter, of course the “V” for the belt is cut into this, you would also need the fitting adapter to fit it to the motor shaft, Tony at Goldcrest supplied all of this for me. I have found his motors to be extremely reliable, on good days we have run this machine for 8 hours a day with no problems. glad you found the information useful, the machine is still running quite happily and doing a great job. 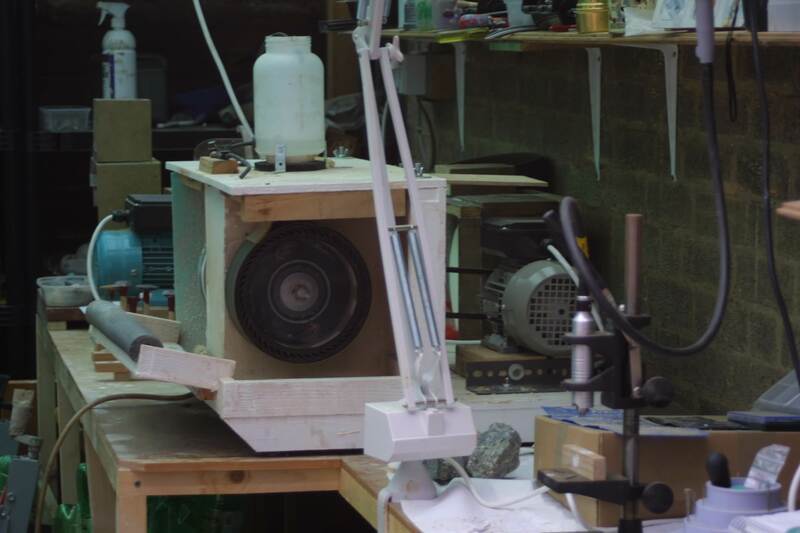 thanks for dropping by, we build our machines because there really is very little available here in the UK and what is available is very expensive. Buying a cab machine from the USA would be even more expensive when importing it. I like the sound of your rough you have, they are huge! Exactly the blog post I was looking for, thanks. Hi Dave, this is absolutely fascinating! A great blog and very good advice. It is wonderful to see how your beautiful jewellery is made, the hard work and thought that has gone into it and the process followed. Amanda.